The Chip Miller Amyloidosis Foundation has been set up to fund research and awareness of amyloidosis. If we can make enough people aware of this disease, maybe we can start saving lives and make a difference. Amyloidosis results when enough amyloid protein builds up in one or more organs to cause a malfunction. Amyloid is an abnormal protein that originates in bone marrow. The heart, kidneys, nervous system and gastrointestinal tract are most often affected by the disease. Symptoms can include weakness, diarrhea, weight loss, severe fatigue, enlarged tongue, shortness of breath, swelling of ankles and legs, dizziness upon standing, numbness or tingling in the hands or feet or a feeling of fullness after eating smaller amounts of food than usual. For more information on this disease, go to amyloidosis.org. The first time I met Chip was in the early ‘80s at an antique car club Christmas banquet in Charleroi, PA where he was the guest speaker. I still remember him telling the story of how he and Bill Miller met and then started what is now known as Carlisle Events. From 1980 on, while my mom and I were restoring my 1960 Corvette, we made numerous trips to Spring and Fall Carlisle swap meets searching for original Corvette parts (namely a 4656 fuel pump and a hardtop wrench). By starting the Corvettes at Carlisle event, Chip certainly made things a lot easier for a lot of people. After completing my car in 1988 and showing it several years at Carlisle, it was an honor to be chosen as Best of Show in 1989, as a “Chips Choice” car in 1999, to represent the 1960 model at the Evolution Display in 2003 and represent the 1958-1960 NCRS Gallery in 2005 to name a few Carlisle highlights. 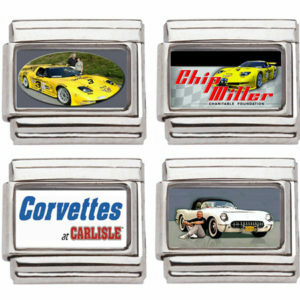 Chip was also instrumental in finding an inside vendor space for me at Corvettes at Carlisle a few years back when I was jobless and trying to get this Corvette Jewelry business off the ground. The photo on my company logo was taken in front of Chip and Judy’s home and is one of my favorite pictures of “Baby Jaws”. So I would very much like to help this worthwhile foundation. 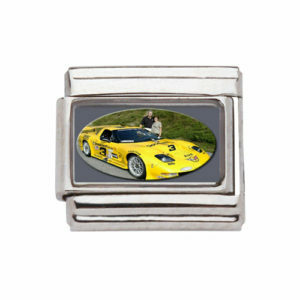 In memory of Chip’s love for Corvettes and people, KIM’S GOLD DUST is proud to offer jewelry items to benefit the Chip Miller Charitable Foundation. Official Chip Miller Charitable Foundation Italian charm, fits 9mm bracelets. Remember, proceeds go back to the Foundation. 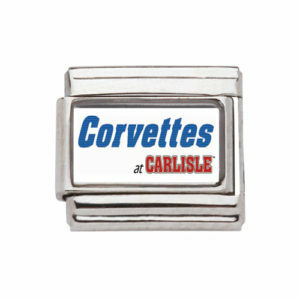 “Corvettes at Carlisle” Italian charm, fits 9mm bracelets. Remember, proceeds go back to the Foundation. 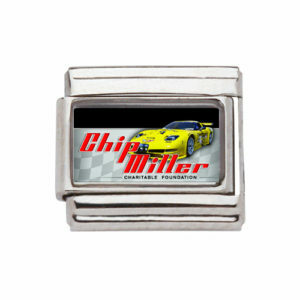 Chip Miller’s yellow race car Italian charm, fits 9mm bracelets. Remember, proceeds go back to the Foundation. Collect all four Chip Miller Charitable Foundation Italian charms and save. Charms are also sold individually. Remember, proceeds go back to the Foundation. 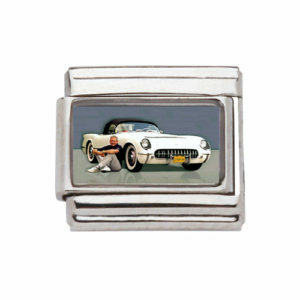 Chip Miller sitting by his 1953 Corvette Italian charm, fits 9mm bracelets. Remember, proceeds go back to the Foundation.